Maynard Art Show: Often astronauts look for cloud-free views, so that the land isn’t obscured. Yet clouds are an essential part of Earth’s eco-system, and tell their own part of the story. 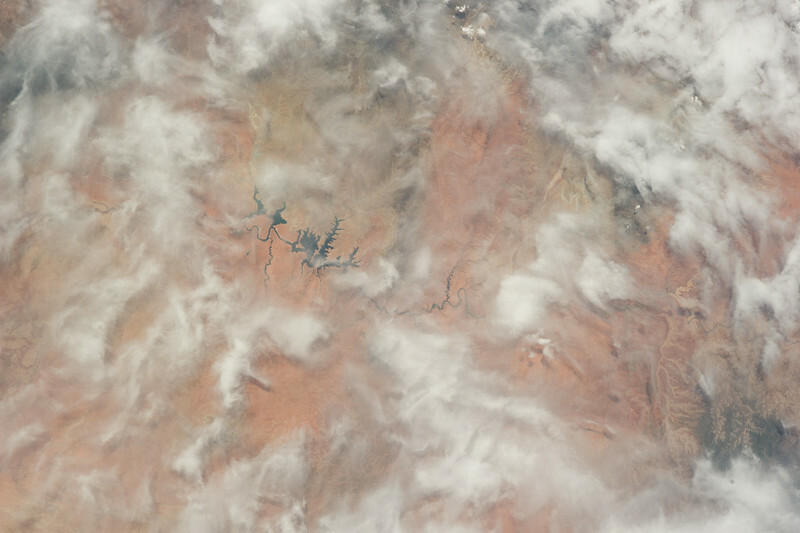 In this photograph of Lake Powell (the dark lake in the center), the wispy cirrus clouds add an ethereal artistic touch. Lake Powell is part of the Colorado River system, turned into a reservoir by the Glen Canyon Dam, completed in 1966. It serves as a useful reservoir to control river flow, and provides electricity for the region. It took 11 years for the lake to fill. Rain and snow fall (from clouds) replenish the lake.